This tuning module for Yamaha PW (Powerdrive) systems convinces with some interesting optimization options which you won´t find in most other E Bike tuning tools. The first special feature is that the VOLspeed Tuning Box can be conveniently controlled via the buttons at the electric bike display – you do not need a PC or a smartphone. You can set the height of the maximum motor support to an individual value between 25 and 99 km/h and you are able to activate a so-called “dynamic mode” - this mode reduces the annoying "wall effect” (=the abrupt stopping of the motor support when the maximum support is reached). This is a cool feature that leads to a much more pleasant driving experience. In addition, the display still shows the correct speed, even when the tuning tool is activate. The installation of the VOLspeed Tuning Box is simple and can be done at home within only 15 minutes – all you need is a little bit manual dexterity. 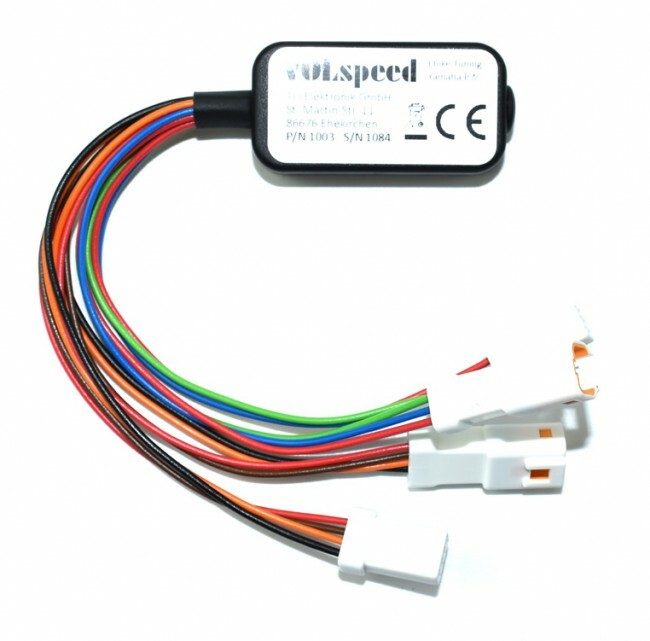 Like other tuning modules, the VOLspeed Tuning Box must be mounted directly to the engine. There is no need to change or modify any cables, just plug in the module. After installation, the module is no longer visible from the outside. Please note: Currently not compatible with LED display! - Maximum motor support can be individually raised from 25 to 99 km/h (speed mode). - "Dynamic mode" adjustable: This mode leads to a softer or more dynamic engine shut down when the maximum supported speed is reached (reduced "wall" effect). This is achieved by extending the shutdown of the engine support to a wider speed range, so that the stopping is no longer as abrupt. - Convenient operation of the tuning module via the control buttons at the E Bike display. - Switch the module on or off using the buttons at the E Bike display. - Correct display of current speed and mileage. - Correct total kilometres, even after removal of the module. - Remaining range calculation taking into account the current driving style and the current power consumption (speed mode). - The module is protected against splash water. - E Bikes with Yamaha PW (Powerdrive) engines from 2014 onwards.